Post #150. Where does the time go?! Amy belongs to the Northern River Pixie Clan. The Northerners can speak to more of the animals than any of the other clans, though they are poorer at gardening and plant speak. Amy has a particular affinity for small wildcats. And she is Maiden #67. Each 2.5″ x 3.5″ art cards. Copic markers. First scrapped title: Enigmati-cat. Second scrapped title: Saint Gretchen.They call her Gretchen though none know her true name. 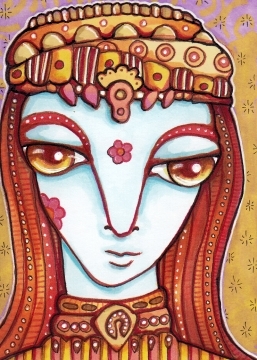 She has been depicted in holy ancient artworks spanning two centuries and sightings continue to this day, usually near a site of religious significance. The grey cat with the fancy tie is Ed Cat. He does not like you. Or rather, he wants you to think he does not like you, to retain his haughty cat street cred. But really he does like you, and he will sneak onto your lap (or possibly your head), if you ignore him properly. I really must get back to Illustration Friday! I don’t know the word yet but I will definitely do the next one! Thanks for stopping in! 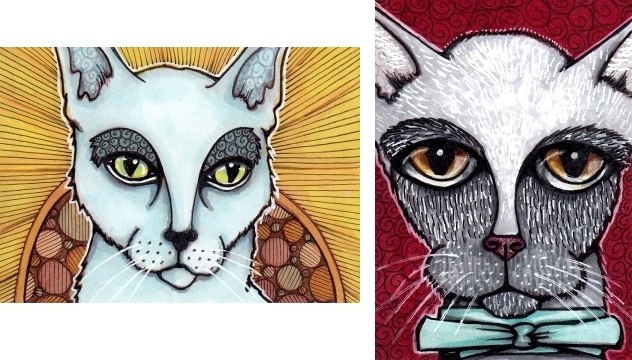 This entry was posted in ATCs and ACEOs, Copic Markers, Progression Photos, sketches and tagged aceo, atc, cat art, Copic Markers, illustration, pen and ink on February 14, 2013 by The Beast Tender. Oh! They’re all so lovely!!! I have lost my touch with IF, too, this year. Too much to do, so little time!!! Have a great weekend!!! As always I love your fun patterns and rich colors! And you get an “A” in storytelling too! I like Amy, but got to tell you that the cats are simply marvelous! Interesting Fae……reminds me of the aliens from Avatar the movie. She is quite exotic. Love Patron of Saints Cat….the glowing light green against sunburst is wonderful. I love the progress shots of Ed’s eyes – great job with capturing the reflected light and deepening your values! Saint Gretchen does look very regal and egyptian. Ed eyes are so piercing! As always, such great stories. What comes first the story or the drawing? I love the back stories you create for your characters. And you’ve been doing such great dogs lately. So yes, bring on the cats! And I’d love to know where the time goes too. Especially the one that seems to be in such a hurry. I love the eyes you create, Cindy. They are always moist looking and the prominent feature on all your portrait creations. Your cats are superb; always! They have always caught my attention.